knot top dead center of steering wheel? I've seen a small piece of rope (leather?) tied on the TDC of the steering wheel on a number of boats. I'd like to put one on my boat. What type of knot is typically used? Re: knot top dead center of steering wheel? triple turks head is salty, but a simple whipping will work too. 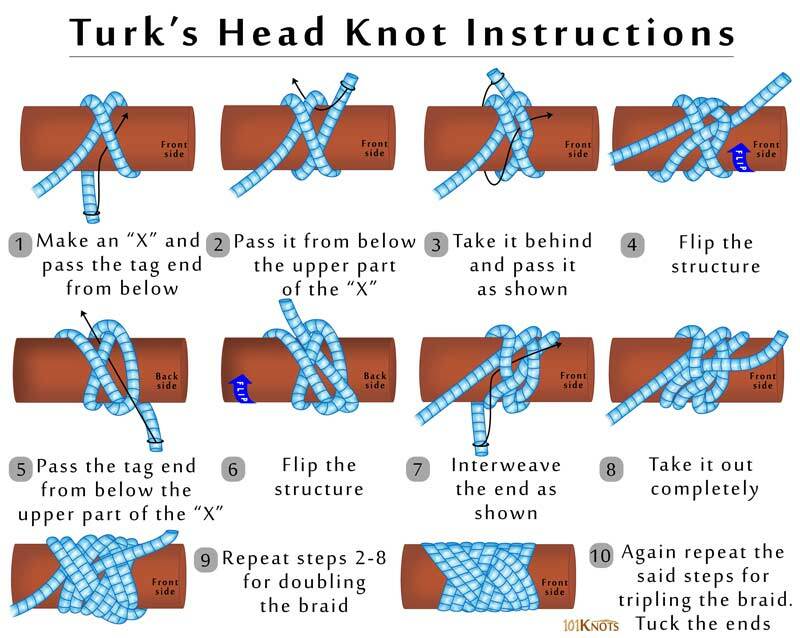 The most sophisticated knot to mark the “king spoke” is the three legged Turks head. It’s permanent, it feels good under hand, and looks sharp. It’s worth doing little things like this “right” because every time you look at it you’ll feel warm and fuzzy in a way a “simple whipping” would never do. Heck, if you’re going down market, a piece of tape will do. Heck, if you’re going down market, a piece of tape will do. Thanks for confirming that my handicraft is classed “down market”. I've also always just used a piece of tape. It id s worth initially using tape to ensure it is in the right place. Most boats require some windward tiller when on the wind (creates some keel lift). Usually between 5 & 10 deg. You could then use 2 knots one for each tack. Off the wind you would be in the middle. Here's a link top someone that's taken them to an extreme: Windy Chien's Year of Knots. My first thought. With two helm pumps and one autopilot pump, my steering wheels will never be in the same position at 0-degree rudder twice. My favorite wheel-mounted rudder position indicator was a small, round plastic disk with a spiral inside, which held a steel ball. Sort of like those little maze puzzle toys you see in kids' party favors. The ball would move in or out through the spiral channels by gravity when the wheel turned. When the ball was in a certain spot, the rudder was dead center. Never saw another one, but I still remember it as a very elegant solution, if not as salty-looking as a Turk's head knot. My young daughter loves knots. So, on a previous boat with a wheel, she upgraded the marker on the wheel to a beautiful turks head knot. When I purchased my next boat, a Pearson 30 with a tiller, she proceeded to put a turks head around the tiller handle. Presumably to mark "centre", LOL. But it did look nice and had a nice feel to it as well. FWIW, anyone who fell asleep aboard with an arm dangling/ exposed would wake up with a turks head bracelet on their wrist. This was when she was around 10 years old. Thank you for teaching me a new term, "down market" though not quite certain what that means. Anyway my boat came with a piece of black electrical tape wrapped around the wheel in that magic spot. But with time, hydraulic steering will slip a little in one or the other direction and that tape was no longer near where it should be.